Use this article to guide you as you manually input your data into MoveSpring. Please note: It is up to your challenge administrators to enable manual entry. If you do not see this option under devices it is not allowed for your group. 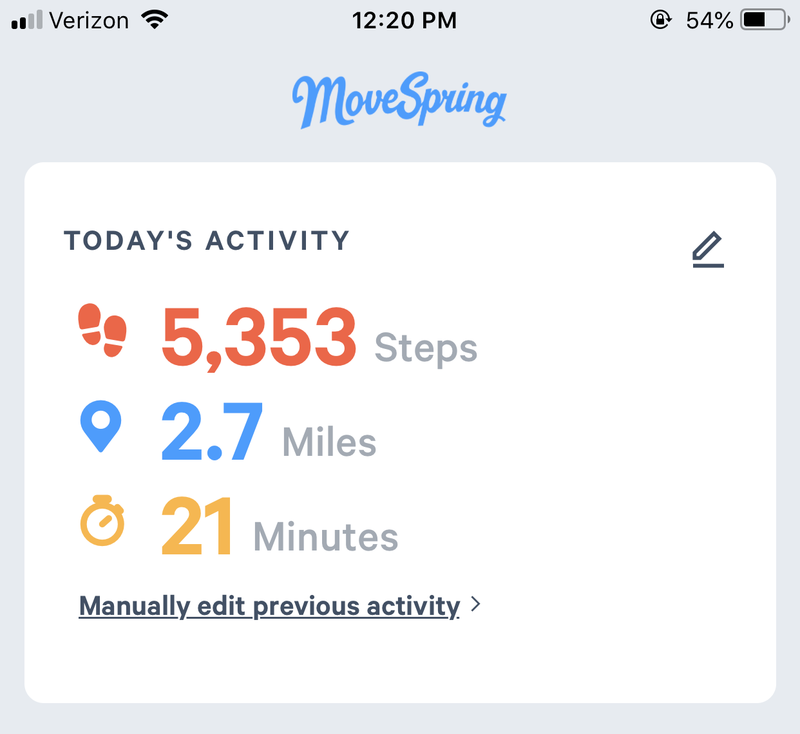 If you use a pedometer, don’t have a device, or your current wearable doesn’t integrate with MoveSpring, you can use manual entry to add your activity to join in on the fun. Just like any other device, when using manual entry make sure you enter totals regularly. We recommend entering totals every day or at minimum every 3 days to make sure you're scored correctly in the challenge. When using manual entry you can enter 5 days of data (the current day and the previous 4). You must enter each day's data individually. Do not add in sums of data over a period of time for one day. This will throw off challenge stats. Grace period rules always apply. Once a challenge group moves to the completed tab all scoring is final and challenge stats can no longer be updated. Any totals you add for the duration of the challenge will save to your MoveSpring account, but these will not update in your challenge. To select manual entry go to Settings in MoveSpring, tap the device field, and select manual entry from listed devices. If you're already on manual entry skip this step. From the dashboard select the Edit pencil icon in the top right hand corner. 4. Manually add your steps, distance and active minutes for today, then tap Save. 6. Tap the Edit pencil icon for a given day and enter your step, distance and activity data. Tap Save. Whether you've forgotten your device at home or it's died at the office, there's no reason you should have to miss out on your activity. When you're switching back and forth between a wearable device and manual entry, there are a couple of things to keep in mind. The MoveSpring platform does not combine your activity count between devices. What this means is that, when you switch to manual entry, you'll have to add your two totals together and write the combined number into the manual entry field before saving. MoveSpring will always keep your higher number of activity. 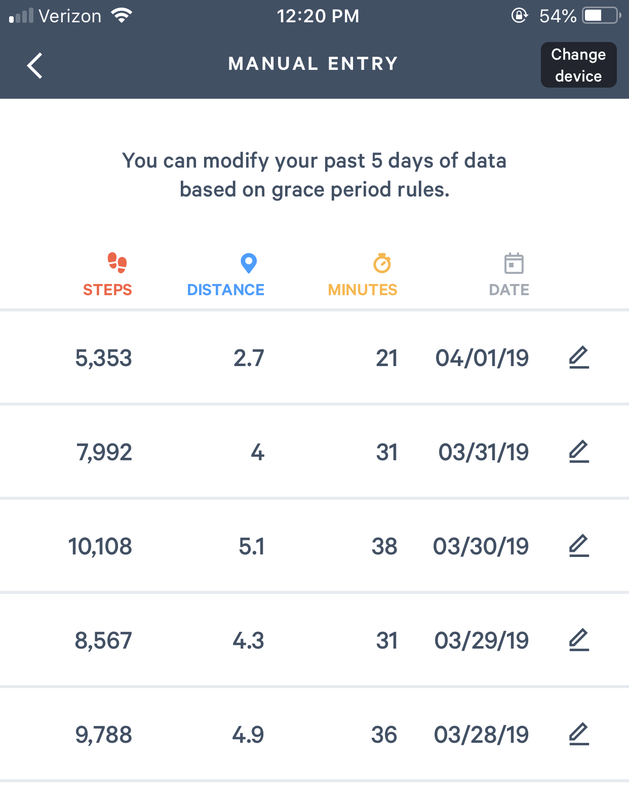 Say you have 5,000 steps synced into your challenge group and gain an additional 1,000 steps outside of what's tracked on that specific device. The next step would be to switch to manual entry to enter in 6,000 steps. 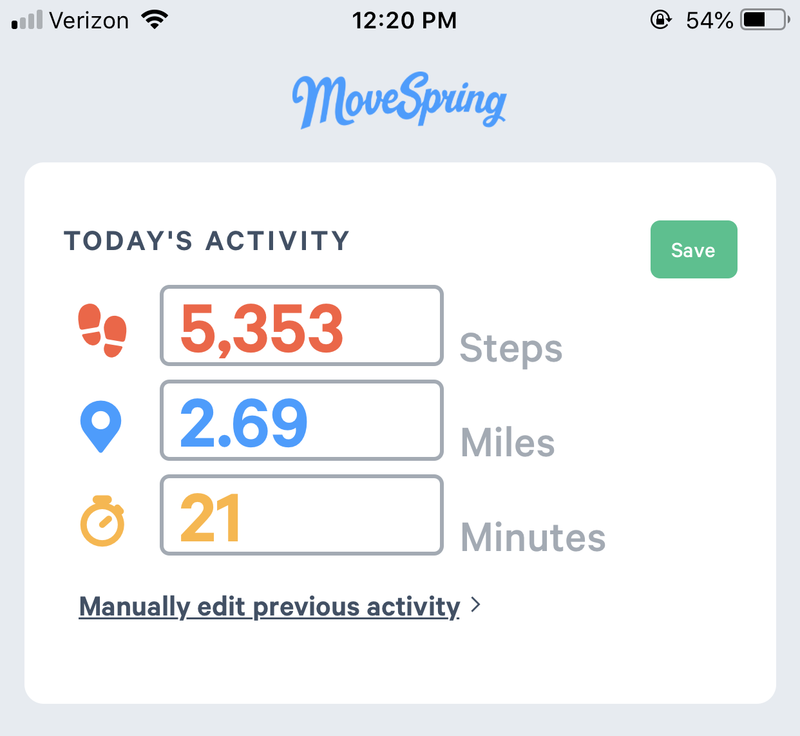 Since MoveSpring always keeps the higher number if you're combining steps from two devices in one day what we suggest is doing this once a day the morning after the day is complete. So you have total step counts combined for your devices and the most accurate number in the challenge. You'll just switch to manual entry and conclude your steps for the previous day, and then switch back to your device to do the same the next day.